Once your school has enabled online payments, you can pay using a credit card or bank account transfer (ACH) by clicking "Payments" on the lefthand side, or "Pay Now" on the right. Parents are able to set up online payment methods separately. 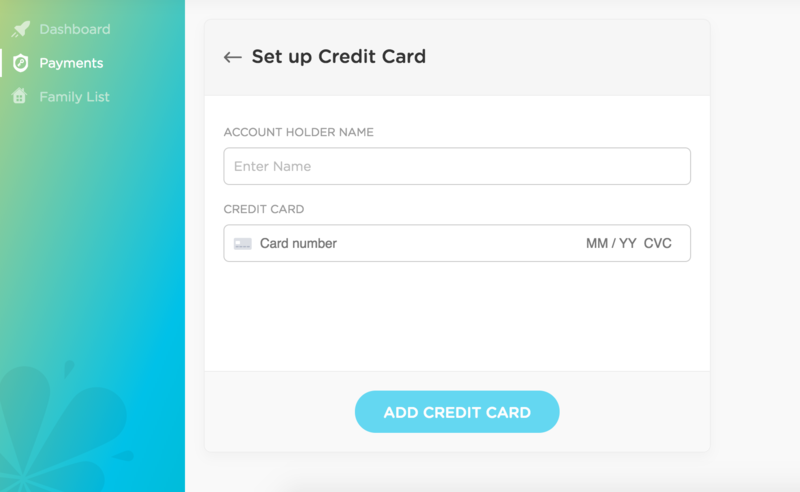 This means that if one parent sets up a credit card on their account, the second parent will still see a "Set Up Payment Method" button on theirs. The second parent will not be able to view or change the first parent's payment method. In order to set up your payment method, click on the blue "Set Up Payment Method" button. Select which method you would like to add. When adding a credit card, you will see this screen. 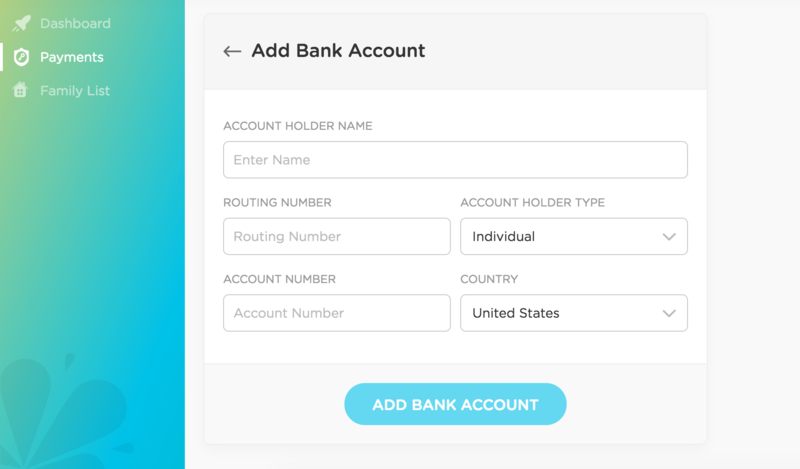 While adding an ACH / bank account, you'll see the option to connect with your bank directly or add the routing number manually. If you choose to connect with your bank directly, you will be asked to log into your bank account through Plaid, an extremely secure platform that will immediately verify your identity and your bank information to begin processing payments. After entering your information, you will receive two micro-deposits in your account within the next two days. Once they appear, you'll need to verify your account by entering the amounts of the micro-deposits. NOTE: There is a short window of time when you can enter these micro-deposits for verification. Once the window has passed, you will need to start the process over again. 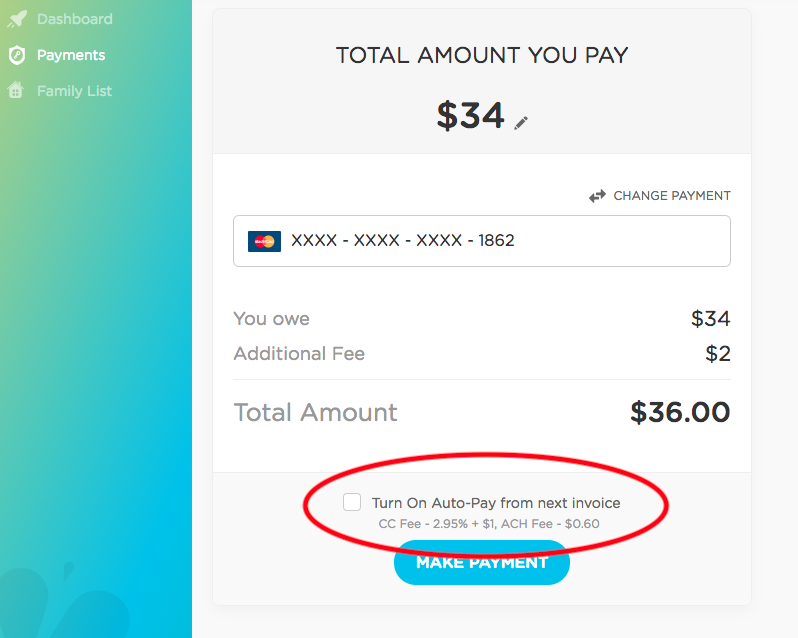 If you enable auto-pay when setting up billing, funds will be pulled from your account on the due date listed on the invoice every billing cycle. If you disable auto-pay, you will need to initiate the payment every billing cycle. NOTE: The school retains the ability to manually auto-debit even if auto-pay is disabled (talk to your school for details).